We have a two-part post today… tips from around the ‘Net… then a guest post by the fabulous Carrie Nelson of Miss Rosie’s Quilt Co.! The post is filled with gorgeous photos to inspire you to organize your own quilting space. Reminder: Share your Before photos on last week’s post: A Space of your Own for a chance to win. We have two copies of Organizing Solutions for Every Quilter: An Illustrated Guide to the Space of Your Dreams to give away. Here are some few tool storage ideas that I totally love! 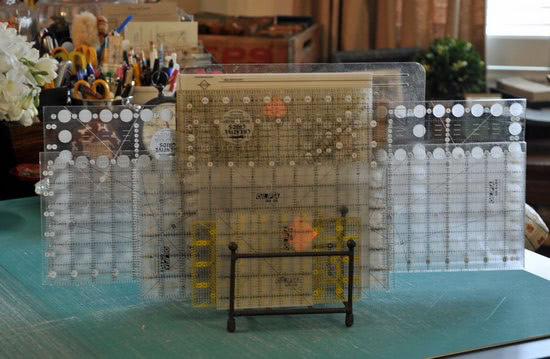 Christine shared her studio photos in the link party and I really like her ruler storage. Not only is she clever to make such a pretty ruler holder, she shared a tutorial on it too! Thank you Christine! Carolina of Always Expect Moore has a scissors holder that I think will be great for the work space or even to hang in the closet. How about hanging it on the end of your cutting table or bookcase? Make it Love it blogged jewelry hangers … scroll down to the bottom to see how they show it being used with sewing notions. Then I went to my Facebook group and asked for their tips… really wonderful ideas out there! Bert K. – The best way to store a quilt is flat on a bed. Even if you have 15 layers on the guest bed! An alternative is to roll it onto a pool noodle. You can even connect two pool noodles with a dowel for a wider quilt. Becky S. – I store my smaller quilts/wall hangings on my spare bed under the comforter. Hope T-L – I have an antique trunk that I have with cedar balls and dryer sheets in it. One of my grandmothers had an old trunk filled with quilts, so it’s a nice reminder of her. Jacqueline S. – Use Soak Wash – Wash the quilt before storing it! Cork G. – I like to make a pillow case out of leftover fabric. That way I know which quilt is which. 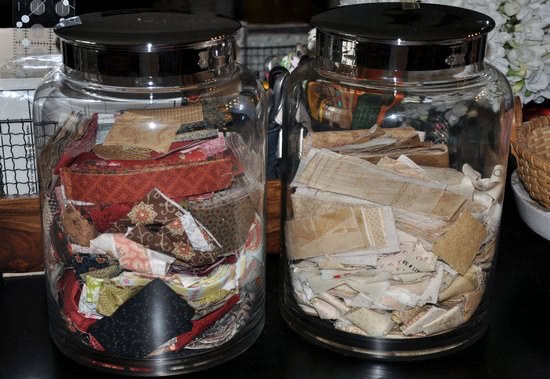 Vicki H. – My mom has a huge tall antique crock filled with rolled quilts. They stand up and are visible yet useable. 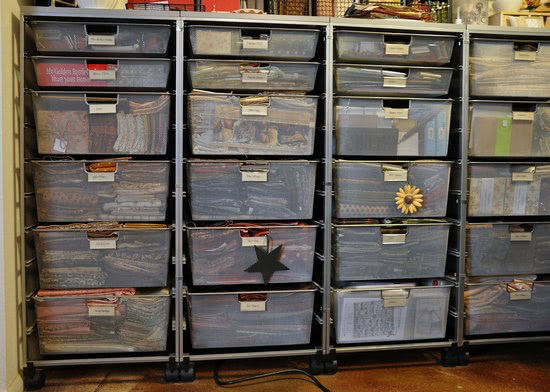 Vicki K. – For my patterns I have a portable file & I’ve organized them by applique, pieced, paper pieced & etc. Marianne H. – I put those 3M hangers down the side of one of my bookshelves and hang all my rulers. Rebecca H. – When I buy yardage I fold it around my 6″ ruler then fold it in half to store it. When I need it later I can count the number of 6″ folds to see how much I have. Sheryl W. – I hang my UFOs and small finished projects (runners, wall hangings, etc.) on those plastic pant hangers that clothes come on at the store. Or I hang a quilt top and the backing fabric together on a purchased slacks hanger so I don’t forget and use the backing for something else. 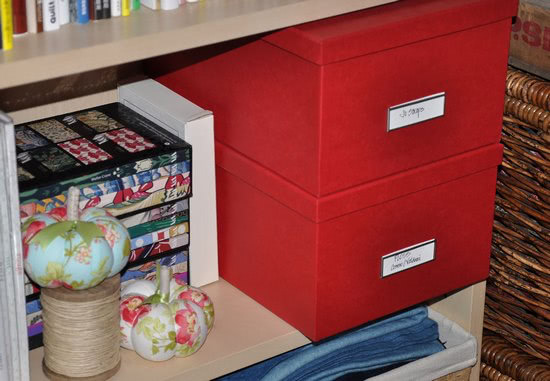 Cheryl V. – The compartment shelves they sell for shoes make great storage for folded fat quarters and half yards. I use the plastic drawer units they sell to store scraps that I have cut into usable strips and squares, and I sort them by size in the different drawers! 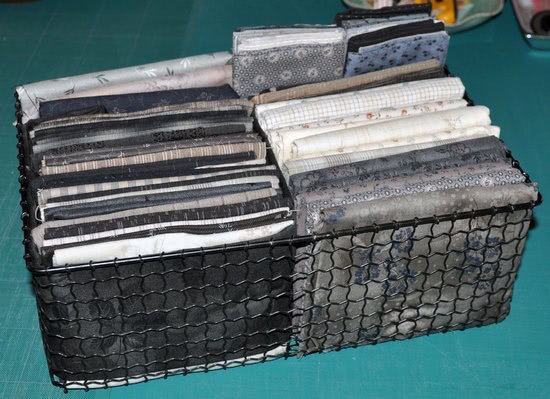 Lisa V. – I store my patterns in binders with headers, baby, lap, purses, etc. All my scraps go into an old trunk under my custom fold-down cutting table (which is always in use so never folded). Stencils hang on push pins on my wall. I use an Ikea bookshelf for all my fabric sorted into flannels, baby, etc. Lorry K. – I have an old “Red Vines” red licorice canister similar to a cookie jar – I store packages of unopened rotary blades in it. Now onto Carrie Nelson of Miss Rosie’s Quilt Co. She is a master at using her work space in a way that blends with her work style. I wrote to Carrie and asked for her top tip. Well Carrie wrote back with an amazing array of ideas anyone can do! What is my top studio ~ workroom ~ idea or tip? LABELS! Seriously. 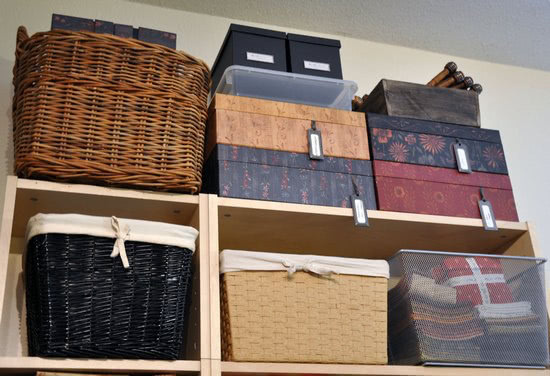 No matter how many great boxes, bins, baskets, drawers you’ve got, it isn’t organized if you have to go through half the drawers to find what you’re looking for. That’s especially the case for things that you don’t need or use regularly. The other organization idea or tip is to regularly go through everything and pitch/donate/pass-along those things that you don’t or won’t use. It’s part of that idea of for everything you bring in, something has to go out. Some drawers and boxes get the once-over every year, while others get it every couple of months. I go through my books once a year, especially the magazines that have accumulated. Since I tend to stock up on those things that I use a lot of ~ thread, needles, rotary cutting blades ~ I regularly check and re-stock those drawers. 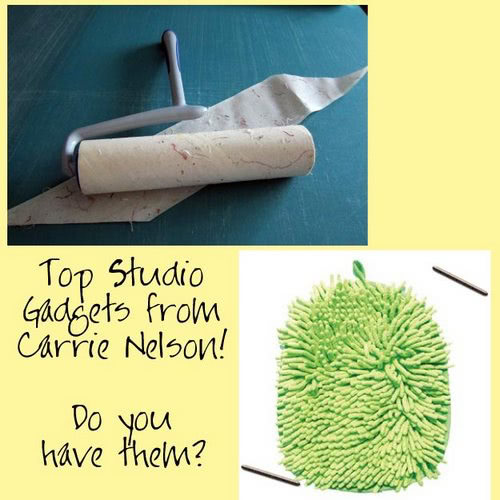 I use two things to keep my workroom “tidy” ~ a micro fiber cleaning mitt and a sofa-size lint roller. Since I have a hard surface for my floor, the micro fiber cleaning mitt is perfect for collecting threads and lint. It also helps me keep my cutting and sewing tables “relatively” lint/thread/dust free. As for the large lint roller, I use this to keep my ironing board and cutting mats clean. After I’m done with a project, this comes out and everything gets rolled. It looks so much better when I’m done and it sort of energizes me for the next project. On my cutting table, I like to keep small scraps together, things that can be used to finish up small projects, pincushions, etc. After having them in various boxes and bins over the years, I realized that I was forgetting I had them so I would cut into new “yardage” when I really only needed a couple of small strips. So I got some big glass storage jars and that’s where those usable little pieces go now. I have one big one for “lights” and another for “mediums & darks”. Organizing. I do use a lot of boxes, bins, baskets, etc. Those boxes/bins that are high up have to have labels as (1) I don’t always remember what’s in there, and (2) doing a quick check is easier said than done. I have to get out the step-stool. Some of my favorite boxes are the “photo boxes” because they are a good size and they already come with a label holder. I have mostly solid color boxes but I also have some printed boxes. I have to confess that when I use them in my room, I prefer that they are mostly the same color, or that they are grouped by color or print. 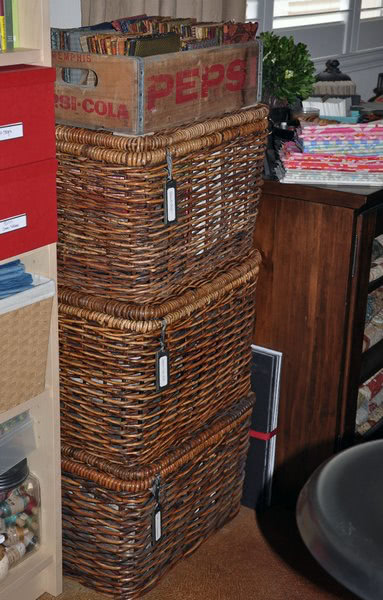 The boxes are perfect for keeping embroidery threads/supplies, supplies for a specific type of project, ribbons & trims, and that sort of thing. My elfa drawers. I realized the other day that I have been using elfa storage systems for almost thirty years ~ yes, 30 years. Three. Zero. And I love them as much now as I did the first time I bought them. They are perfect for studios and workrooms. The top drawers have little dividers and “bins” that contain all of my regular small supplies ~ extra pins, needles, rotary cutting blades, seam rippers, thimble pads, my calculators, some threads, etc. I like having things within reach when I work. If I need a pair of scissors right in the middle of doing whatever, I don’t want to have to go open a drawer to get it. I want to be able to reach across and grab it. 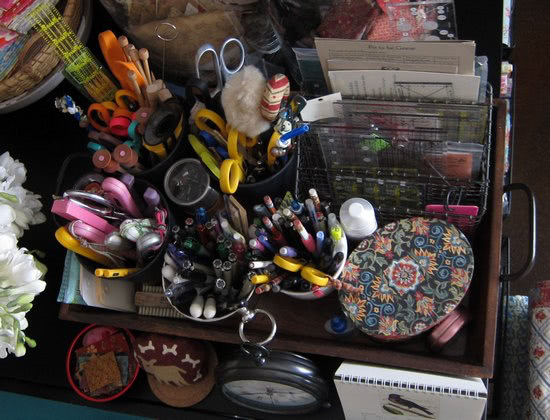 So I have a large wooden tray on my work table that contains several containers ~ a couple were originally small metal flower pots ~ that I use to corral scissors, extra rotary cutters, pens, tools, and such. I’ve also got an old wire letter holder that holds small rulers. I use a metal plate/file rack for my rulers. (I’ve used those wooden ruler racks with the ridges but never really liked them.) The biggest thing for me is that everything is right there, within easy reach. The small dish and tray serve the same kind of purpose, they let me have things within reach but still in one place. I do best when I have a place where “things should go”. When I’m getting things together for a specific project, I like to keep it together in a of my wire “project basket”. Having an open basket let’s me add/remove/re-arrange pieces of fabric, and it lets me get a feel for how its looking. Which ideas of Carrie’s will you do first? What do you already do? A huge thanks to Carrie, and everyone else too, for sharing these ideas with us. This makes me want to get in and (re)organize my sewing room! I LOVE to organize. Great organization tips! I have all of my rulers hanging on the wall above my cutting area. I love all of Carrie’s ideas. 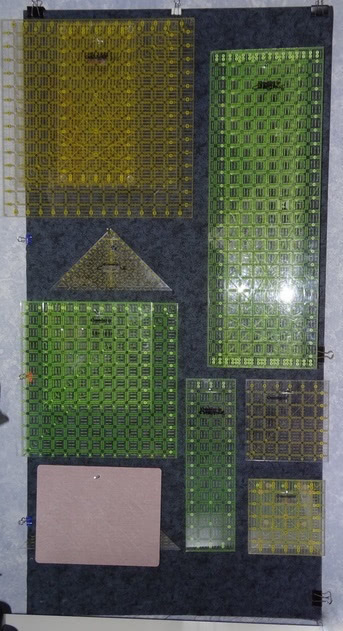 I already use a variation of some of them and may get some of the Elfa drawers if my next quilting room is large enough. Took an old medicine cabinet, removed the doors and use it for all my threads..group them in colours so they are easier to see. Loving the peeks into everyone’s sewing spaces and the organizing ideas! I especially like the project basket! 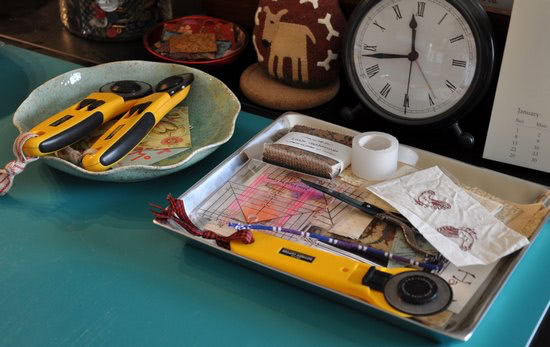 I, too, like having my tools right at hand while I’m working…in order to KEEP them right at hand (and not spread all over the room), I keep a little tray right next to my sewing machine. It’s not cute, like Carrie’s, but it works for me! It’s actually a divided baby’s plate, from the $1 store. Just enough ‘wall’ to keep my friend, Jack the Ripper, and my alternative pressure feet from rolling off the table. 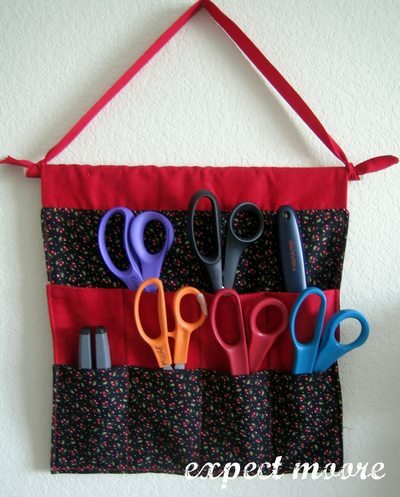 I can also throw a couple of pins there and even my small embroidery scissors will stay put in that little tray. I’m a sucker for organizational containers and I love these! Carrie’s ideas are great! Thanks for sharing them with us. I’m going to get out some empty glass large(half gallon size) canning jars and stuff them full of small fabric scraps this afternoon. Glass jars and labels! I’m quilting now!